At least it was at first. But then I got to thinking. Nobody (well, at least nobody I know—no girl, anyway) wants to be called “Big Tina.” No woman wants to be called Big anything. I don’t, as a rule, find deep spiritual lessons in Dilbert. But when I considered Big Tina’s apparent reluctance to be saddled with that moniker, I thought: You go, Girl! Don’t let anybody call you something you don’t want to be called. Do not receive that! Because we do that, don’t we? Whether it’s a label someone else gives us, or an accusation that comes from inside our own heads, all too often we accept the name and start wearing it–even if it’s a name we don’t want. A name like Unworthy. Or Ashamed. He says we are precious and honored in his sight. And that, as we look to him, our faces are never covered with shame. And that he will never leave us. Why? It’s not because of anything we’ve done. It’s just because we are his. Which, for me, can sometimes be hard to wrap my head around. Like, on the days when I blow it, does God still love me as much as on the days (well, the day) when I get things mostly right? Does he really want to be with me, even when I don’t want to be with myself? Is there something I could do, some gold-star behavior, that would make God love me more? The answers, for those who don’t like rhetorical questions, are: Yes, yes, and no. There is nothing I could do–nothing any of us could do–to make God love us any more (or any less) than he already does. And please note. 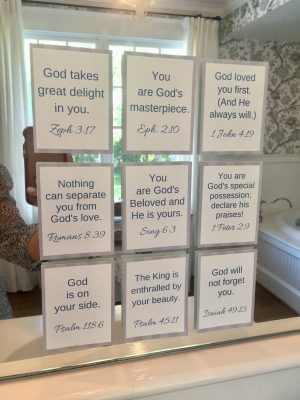 These verses are not like those faux-motivating things you put on your fridge–like the pic of the skinny girl in the bikini–to make you think “This could be you!” The words on these cards are already fulfilled. And they will always be true (even if you do eat that last piece of cheesecake). So the next time the Father of Lies comes along and tries to call you Big Tina (or worse), set him straight. Look him straight in the eye and tell him your name is Beloved. 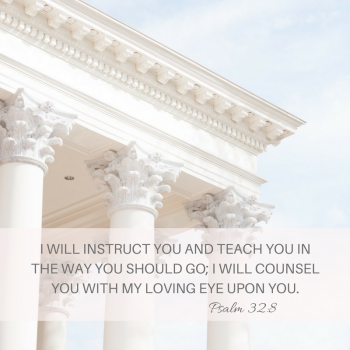 It’s graduation season, and I can’t think of a more encouraging verse than Psalm 32:8. Whether our kids are headed to college, to new jobs, or into the great unknown, the whole “What’s next?” thing can be daunting! And as parents, our hearts can feel like a tangled mess of emotions: pride of accomplishment, sadness over the chapter that’s closing, or even (particularly when we don’t know what the future holds) uncertainty, with maybe a little worry mixed in. The pride and the sadness are both beautiful things; why else would 97% of all high school yearbooks and 29% of commencement speeches give the nod to Dr. Suess: Don’t cry because it’s over, smile because it happened? The uncertainty thing, though, is not so much fun. And if that’s where you are (like, if your child needs a job), I’ve got three things that might help. I don’t know whether Virginia was right or not. A point in her favor is that she actually worked in U.Va.’s Career Services office, where she would have had access to numbers like that, but you have to stack that against the fact that she is her mother’s daughter, and statistics (like that bit about yearbooks and speeches) sometimes get made up on the spot. Either way, though, the data made me feel better. And if it helps you to repeat this 72% claim, you can say that you read it in a blog. And finally, it can be good to remember the plan. We might not know what it is, but after praying (and yes, worrying) three kids through the job-hunting process, I’m finally coming to realize that God does. He knows exactly how our children are wired (Psalm 139:13-16); he’s already lined up good work for them to do (Ephesians 2:10); and he promises to instruct and counsel them in the way they should go (Psalm 32:8). Our job isn’t to worry or nag; our job–if we want to get on board with God’s plan–is simply to trust him. So there you go: Repeat iffy statistics, pray for your kids, and trust God. And if you want help with tip #2, the folks at FaithGateway surprised me a few weeks ago when they sent word that they’d pulled a collection of prayers from the Adult Children book and created a beautiful “Praying for Your Graduate” resource for parents (click here to download): The guide includes 21 prayers, all neatly divided by seven so that you can pray one every day for three weeks. 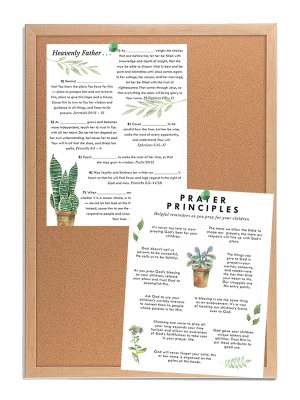 A Printable Mother’s Day Present–for YOU! Mother’s Day is on Sunday. 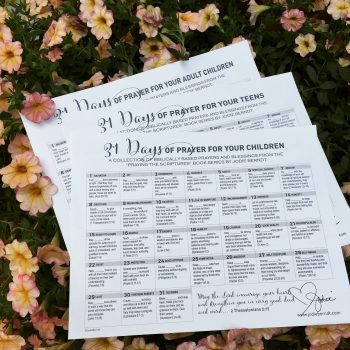 I’ve spent the past few weeks noodling over what sort of present I wanted to give to the moms who follow this blog, and I’m super grateful to the folks at Yellow Leaf Marketing for helping me pull together a series of printable prayer calendars: One for CHILDREN, one for TEENS, and one for ADULTS! I’ve said it before: There’s not a need we will face in parenting—or, for that matter, in life—that God has not already anticipated, and provided for, in his word. Which is, for me, good news and bad. The good news is that, no matter what we desire or need—wisdom, friendships, safety, courage, patience, or anything else—he has us covered. There is a verse (or 20!) that applies! The bad news is that these calendars cover just 31 days. I had a tough time picking which of God’s promises to tap into and pray. You’ll find a lot of my favorites, but if you’ve got a concern you don’t see in this collection, you know what to do. Grab your Bible, and just start mining the gold for yourself. I could hear him back there, bouncing his basketball. We were on our way home from elementary school, together and yet not. Peter (the coolest boy in the whole third grade) walked twenty feet behind me. I didn’t look back. Suddenly, the bouncing stopped. A split-second later, I felt the breath leave my body. Peter had thrown his ball and—since he was also the most athletic boy in third grade—it had hit me, square in the back. My mother has never been known for her nurturing personality. She could tell I wasn’t seriously hurt and so, rather than letting me wallow, she pointed me toward the door. I know what you’re thinking. You’re thinking that my mom sounds a little bit crazy. And she is, in a crazy-good kind of way. Like, when my 61-year-old dad was battling brain cancer and lacked the strength to get from the car to their condo, she told him to sit on the sidewalk. “Stay right there,” Mom said (as if my father had another option), and then she disappeared into the building. Five minutes later she returned, carrying the cushions from their lanai, a bottle of Pepsi, and a bag of Doritos. If Peter was surprised, he didn’t show it. If anything, he looked a bit worried. He probably figured my mother had called his—and that he’d be hearing about his behavior as soon as he got home. That’s what most moms would have done, back in the day. That’s what all moms would probably do now. But not mine. Claire Rundle may have been short on maternal compassion and sympathy, but she was long on the Bible. She knew what it said. And whenever anyone tried to hurt her, or one of her kids, she always found a way to pay them back. That’s 1 Peter 3:9. And it worked. Peter never bothered me after that day; in fact, we became friends. And my mom’s crazy counsel—to repay insults with blessings—has stood me in good stead, over the years. Because what I’ve found is that the more I try to extend kindness to people who hurt or offend me, the better life gets. It’s like grace finds a way to get rid of the sting. You know, if you’ve been around this blog for awhile, that I have four children. They’re all grown up now, but I tried to raise them in the spirit of 1 Peter 3:9. I’m sure there were times when they thought I was as looney as I thought my mom was. I’m sure there were days when they thought I was worse. 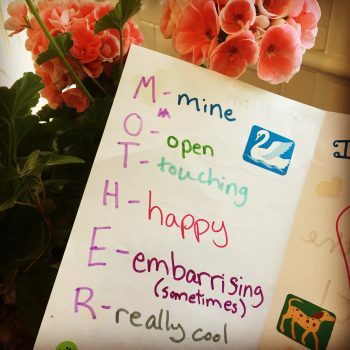 One year, Annesley gave me a homemade Mother’s Day card where she’d picked a word to go with each letter in MOTHER. Yeah. Check out that E.
Honestly, though? I didn’t care if my kids thought I was nuts. I just didn’t want them to miss out on a blessing. And so I encouraged them to invite the mean girl to their party. To bake cookies for our grumpy neighbor, when he complained about the noise that they made. 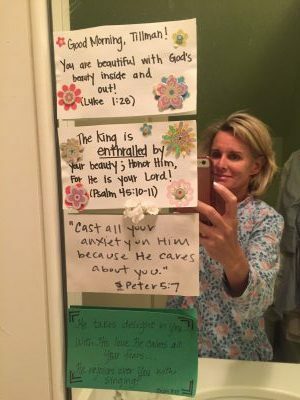 To pray God’s richest favor over the middle school bully. But here’s the thing: Repaying meanness with kindness almost never makes sense, nor is it usually easy. But it opens the door to a life full of freedom and blessing—one that refuses to take up an offense—and for that wisdom nugget, I will be forever grateful to my mother. She and my dad enjoyed their last parking lot picnic back in 2001, the year that my father went to be with the Lord. 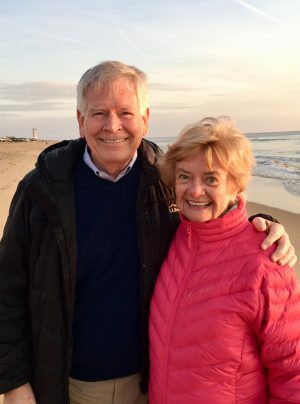 Mom got remarried several years later—her name is Claire Gilman now—and I LOVE my stepdad. John is just as generous and crazy as she is. They downsized recently, moving from a big house to a small condo, taking only their most beloved possessions. As John pushed his favorite stone bench into place outside their new front door, a neighbor approached. John straightened up. “Well I guess I will put it wherever you like,” he smiled. And then he invited the man and his wife over for dinner.